Why I like this problem: This problem is fairly straight forward and a good break from the harder ones. Students each get a different answer, which allows for class discussion afterwards. Observations from class: I had assumed that all students would know their height and weight but they didn’t! I ended up having to ask the school nurse for a scale, and the problem unexpectedly became an exercise in measuring oneself with a measuring stick. I will come prepared for this next time I assign this problem. As students made decisions on which they would rather have, we kept a record on the board, which gave students data to formulate conclusions. 1. What mint-year did you base yourself on for the pennies? Would your answer be different if you had chosen another year? 2. Can you make a generalization regarding which option is more advantageous based on body type? 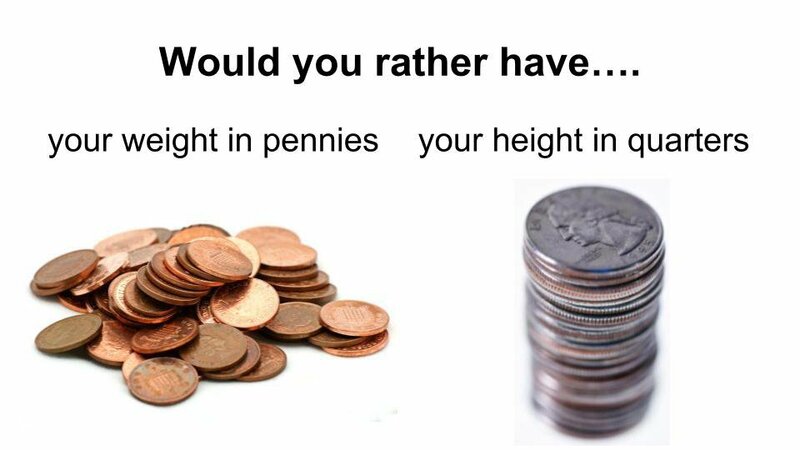 Required skills / content: Understanding height and weight, measuring height, the value of a penny and a quarter, multiplication.